More than 80% of pregnant women suffer from stretch marks. It starts developing in the second trimester and continues until child birth. After child birth these marks start appearing as reddish purple streaks which start darkening gradually. Some may accept these marks as a kind of "rite of passage "or "battle wound" of child birth, but you don't have to! 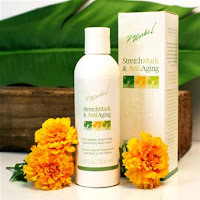 Revolutionize your skin care regimen with luxurious moisture that multi-tasks called Anti-Aging and Stretch Mark Cream! This non-greasy body cream packs a powerful combo of anti-aging botanicals to help restore the skin's youthful glow, while balancing skin tone to minimize the appearance of even the most embarrassing stretch marks and other skin scarring. If you already have the Ultimate Applicator Wraps, I would suggest using the wraps to help with your stretch marks as well.